1 IAF Working Group on FSMS Azusa Nakagawa-Inoue PAC TC meeting 16 June 2010. 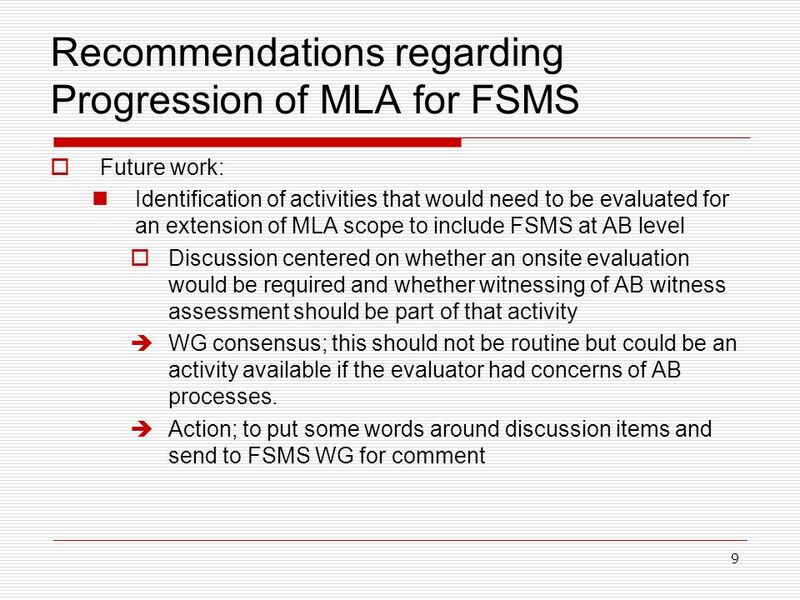 6 6 Scoping of FSMS CBs The WG has had two attempts at trying to gain input from ABs into the review of approaches for scoping of FSMS CBs. 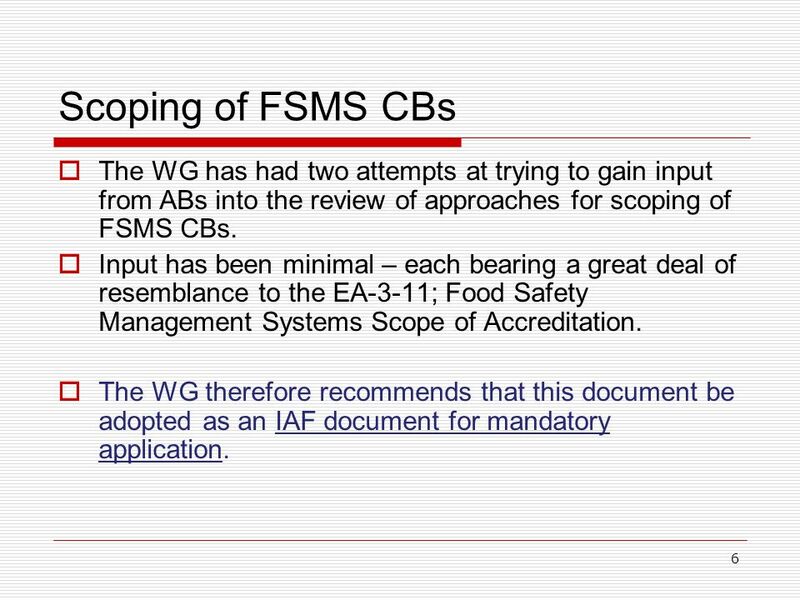 Input has been minimal – each bearing a great deal of resemblance to the EA-3-11; Food Safety Management Systems Scope of Accreditation. The WG therefore recommends that this document be adopted as an IAF document for mandatory application. 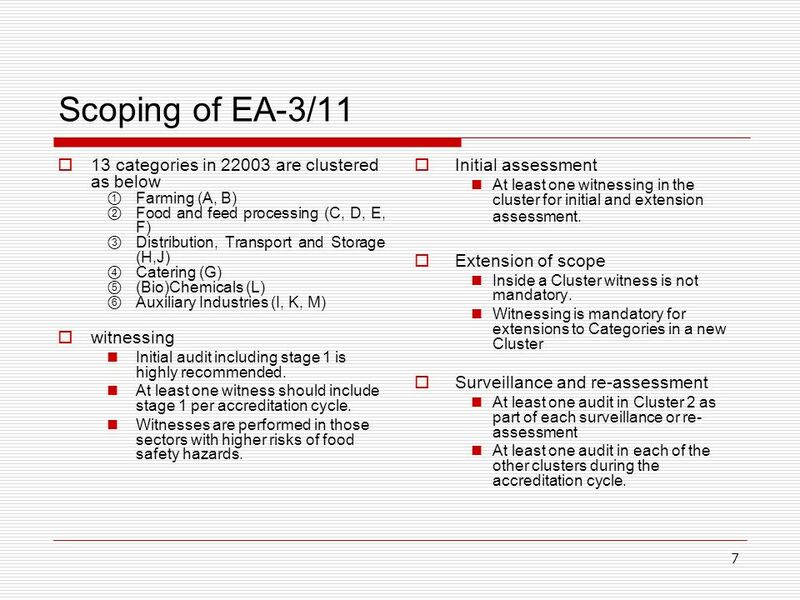 7 7 Scoping of EA-3/11 13 categories in 22003 are clustered as below Farming (A, B) Food and feed processing (C, D, E, F) Distribution, Transport and Storage (H,J) Catering (G) (Bio)Chemicals (L) Auxiliary Industries (I, K, M) witnessing Initial audit including stage 1 is highly recommended. At least one witness should include stage 1 per accreditation cycle. Witnesses are performed in those sectors with higher risks of food safety hazards. Initial assessment At least one witnessing in the cluster for initial and extension assessment. Extension of scope Inside a Cluster witness is not mandatory. Witnessing is mandatory for extensions to Categories in a new Cluster Surveillance and re-assessment At least one audit in Cluster 2 as part of each surveillance or re- assessment At least one audit in each of the other clusters during the accreditation cycle. 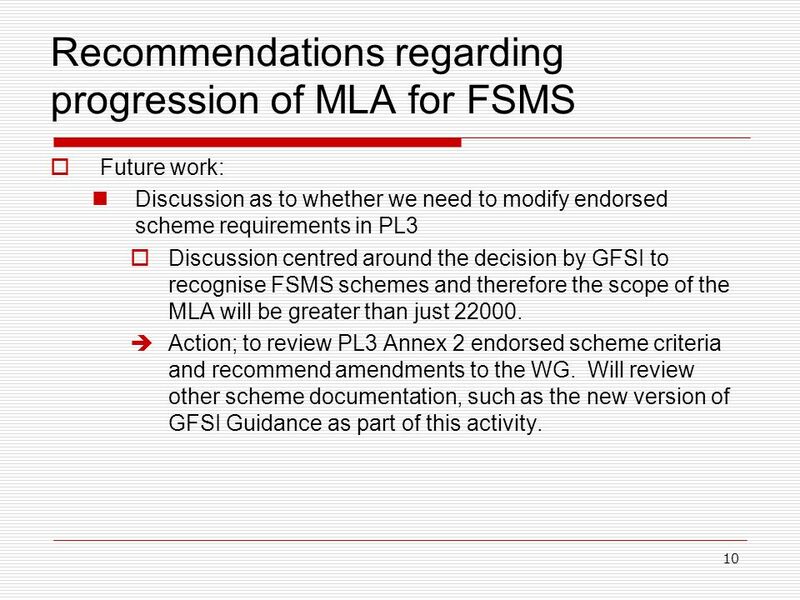 10 10 Recommendations regarding progression of MLA for FSMS Future work: Discussion as to whether we need to modify endorsed scheme requirements in PL3 Discussion centred around the decision by GFSI to recognise FSMS schemes and therefore the scope of the MLA will be greater than just 22000. Action; to review PL3 Annex 2 endorsed scheme criteria and recommend amendments to the WG. 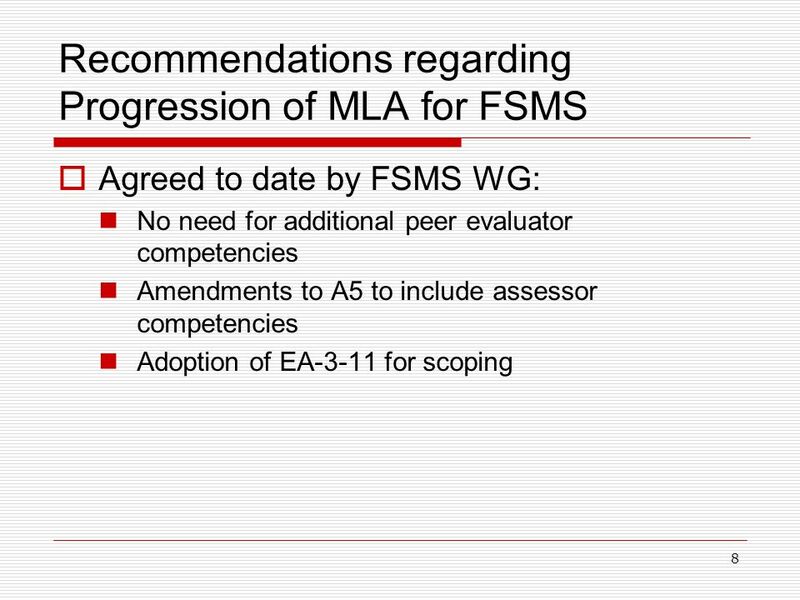 Will review other scheme documentation, such as the new version of GFSI Guidance as part of this activity. 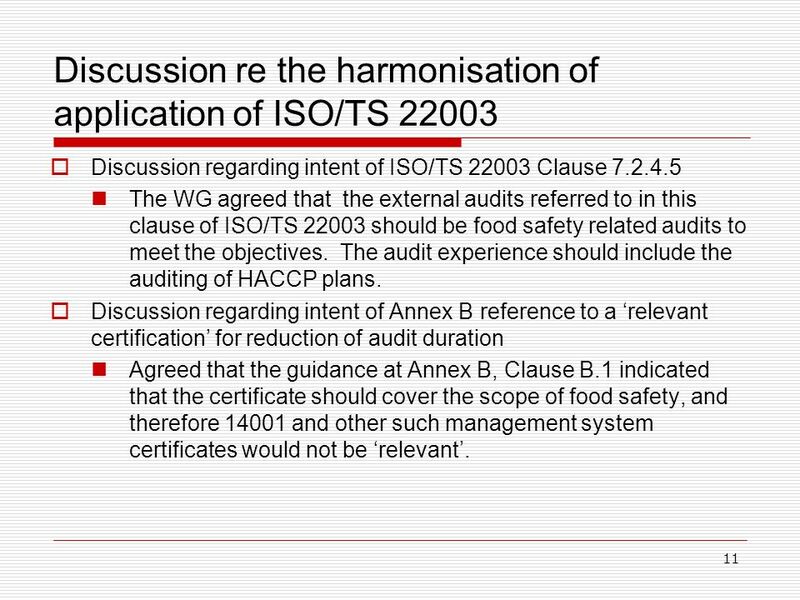 11 11 Discussion re the harmonisation of application of ISO/TS 22003 Discussion regarding intent of ISO/TS 22003 Clause 7.2.4.5 The WG agreed that the external audits referred to in this clause of ISO/TS 22003 should be food safety related audits to meet the objectives. 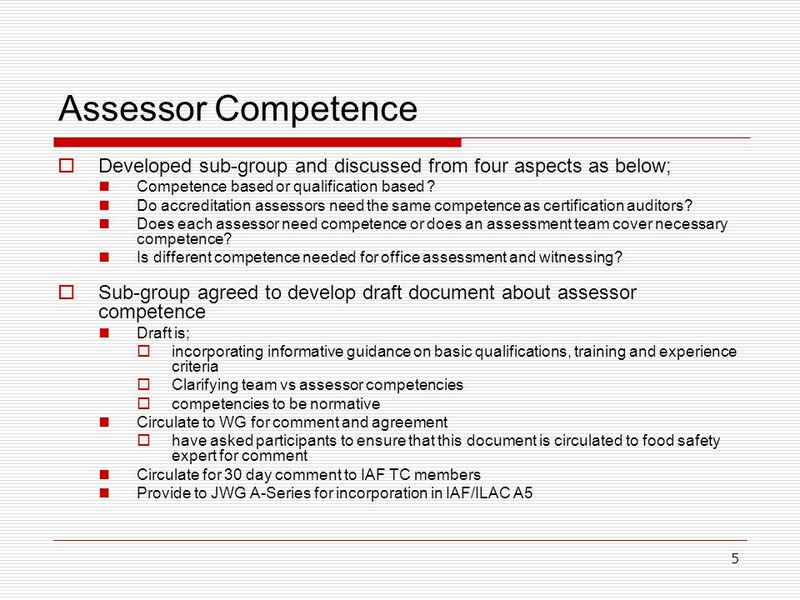 The audit experience should include the auditing of HACCP plans. Discussion regarding intent of Annex B reference to a relevant certification for reduction of audit duration Agreed that the guidance at Annex B, Clause B.1 indicated that the certificate should cover the scope of food safety, and therefore 14001 and other such management system certificates would not be relevant. 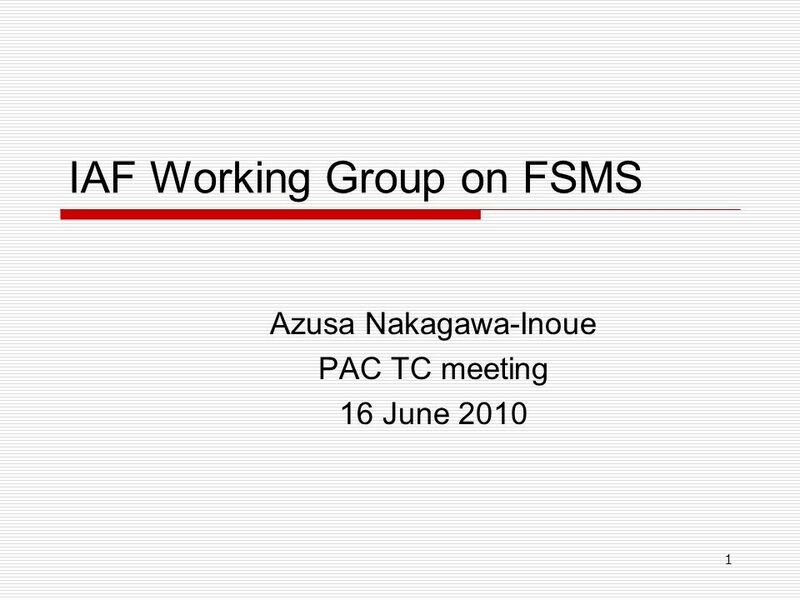 Download ppt "1 IAF Working Group on FSMS Azusa Nakagawa-Inoue PAC TC meeting 16 June 2010." 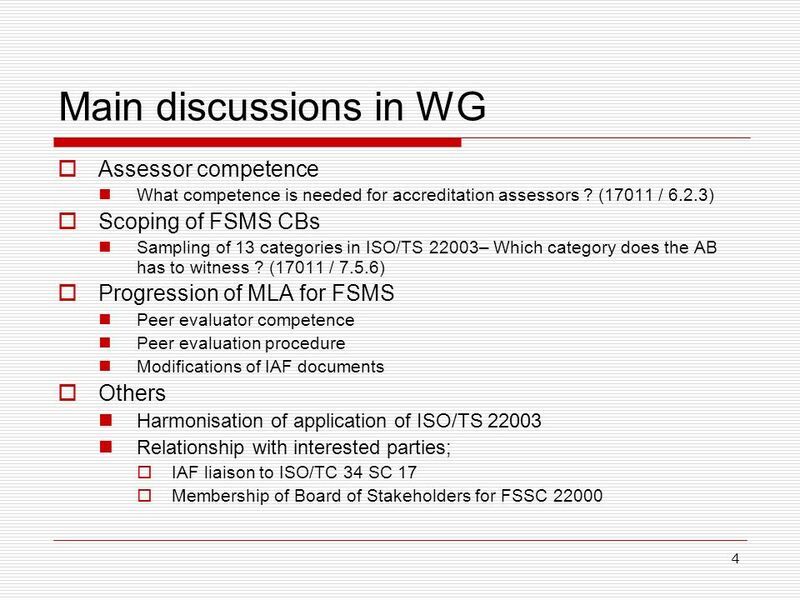 Report to PAC TC: The Result of the Discussion at IAF TC about the Disclosure of MS accreditation and certification Takashi Horie 16 June, 2010 JASC Ver. GEOSS Monitoring and Evaluation Charles S. Baker (USA) M&E WG Co-Chair Joint meeting of M&E WG and ET January 20, 2010 Geneva, Switzerland 1. 1WTO CASCO /17 P. Dennehy International Organization for Standardization. 1Running title of presentation PR/mo/item ID Date Updates on work in Progress in ISO United Nations Road Safety Collaboration 9th meeting Geneva, 17 and. Tutorial for leadership teams of ITU-T study groups, TSAG, tariff groups and focus groups Alternative approval process (AAP) for ITU-T Recommendations. 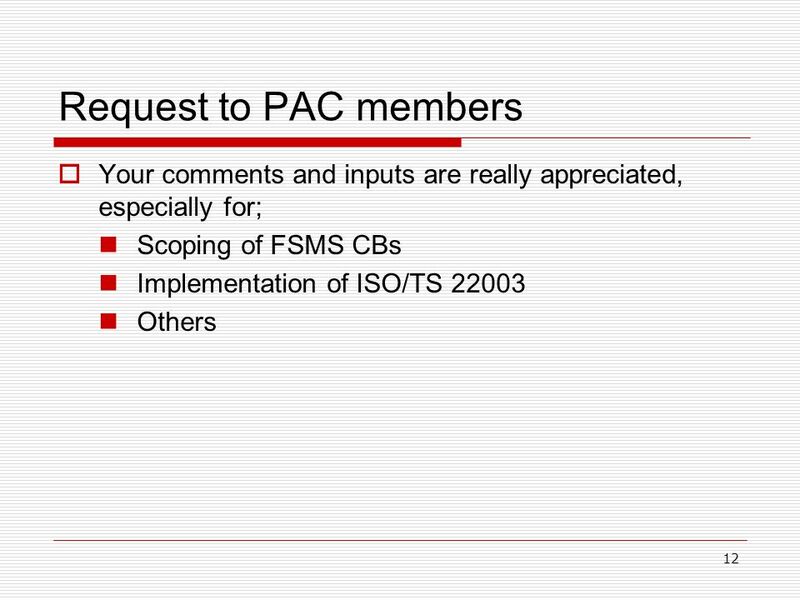 INTRODUCTION & AGENDA ISO 22000, PAS 220 & FSSC 22000: what do they cover, why were they developed, what’s the impact on ISO 22000? Route to acceptance. Module 12 Oversight Assessment of Accreditation Bodies Office and Witnessed Assessment February 2015.